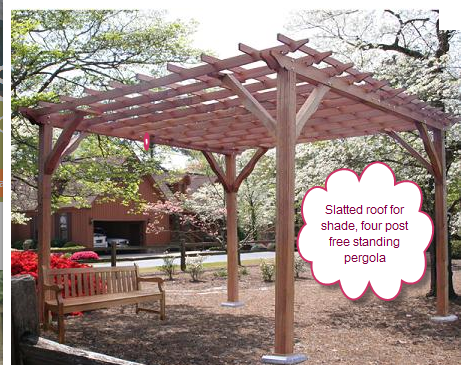 Is a Pergola the same as an Arbor, Trellis or Gazebo? We can answer that question quite easily – no. While it is easy to get confused, there are some key differences between pergolas, arbors, trellises and gazebos. For a very in depth discussion with more pictures, check out the post on this topic over at pergoladiy. Pergola – supported by posts or columns attached to the ground or top of a wall, no sides, partial roof creating a shaded outdoor room or space. Arbor – arched walkway cover not large enough to create a seating area or outdoor space. Has narrow, latticed side walls. Primarily used to delineate an entryway between garden areas and support for vines. Trellis – Often a single sided structure of latticed wood pieces without set up against a wall to support plants and vines. Gazebo – The closest of all to an actual free standing room with a complete floor and roof and at least partial walls. The most expensive and more complex to build or install. The reason that pergolas are so popular is because they encompass the best of each structure type. They have the versatility to provide plant and garden vine support – in fact, there are often partial lattice wall extensions attached to the sides pergola posts that end up creating a trellis wall additions to a pergola. On top of that they also provide shade and the visual framework of an outdoor room but without the expense and construction skills needed for a gazebo. We have chose to focus on helping people build pergolas because they are the most versatile, inexpensive additions to a yard that will provide the longest term value and enjoyment for the money.